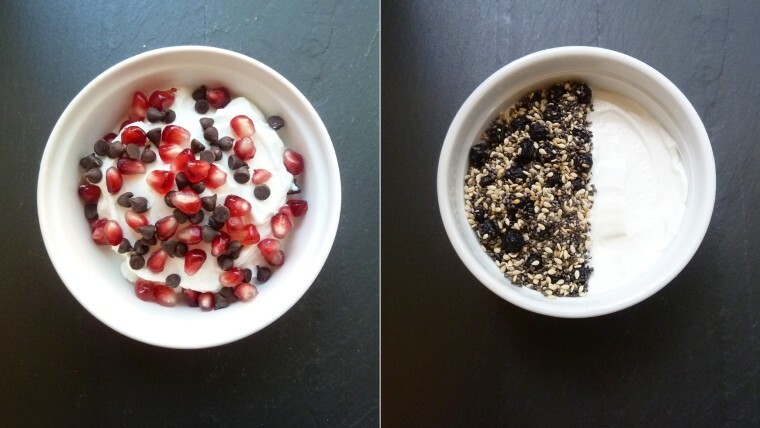 There’s a reason — or several, actually — why yogurt is such a popular breakfast. Packed with calcium, protein and good-for-you probiotics, yogurt is one of the best foods you can eat to kick off your morning. It’s also quick and easy to prepare, and keeps you full until lunchtime. Plus, yogurt is a culinary chameleon and partners with an incredible variety of ingredients, from pears and pecans to almond butter and honey to chocolate and coconut. These 13 ideas go way beyond the standard granola parfait and take almost no time to pull together. And with so many interesting mix-ins and toppings, you’ll never get bored of this healthy, hearty breakfast. The recipes below can be made with Greek or regular yogurt, and any fat percentage will do. (Many popular yogurts come in 5 to 6 ounce containers, so the recipes call for that amount, but you can just scoop about 3/4 cup out of a big container if you prefer.) So grab a container of your favorite yogurt and dig in! Date and pistachios: Pit and chop 1 Medjool date, then stir into 5-6 ounces of yogurt. Drizzle with honey and olive oil to taste, then sprinkle with 2 tablespoons of toasted, chopped pistachios. Balsamic strawberries and toasted almonds: In a small pan, warm 2 tablespoons of balsamic vinegar over low heat until reduced by half, 3 minutes. Add 1/2 cup of thinly sliced strawberries and cook, stirring, for 1 minute. Let cool, then pour over 5-6 ounces of yogurt and sprinkle with 2 tablespoons of toasted, chopped almonds. Cucumber and mint: In a blender, pulse together 1/3 cup of fresh mint leaves and 1 1/2 tablespoons of honey. Stir into 5-6 ounces of yogurt, then fold in 1/2 cup of peeled and cubed seedless cucumber. Butternut squash and hazelnut: In a small baking dish, drizzle 1/2 cup of peeled and cubed butternut squash with olive oil, salt and pepper to taste, then roast in a 400 degree F. oven until tender, 30 minutes. Let cool, then spoon over 5-6 ounces of yogurt. Sprinkle with chopped, roasted hazelnuts and drizzle with honey, if desired. Chocolate and toasted coconut: Add 1 tablespoon each of cocoa powder and honey to 5-6 ounces of yogurt and stir to combine. Sprinkle with 2 tablespoons of toasted shredded coconut. Mango lassi: In a blender, pulse together 3/4 cup of peeled and cubed mango, 1 tablespoon of honey and a pinch of ground cardamom until combined but still chunky. Layer parfait-style with 5-6 ounces of yogurt. Nutella and banana: Stir 2 tablespoons of Nutella into 5-6 ounces of yogurt and top with banana slices. Sauteed pear and pecans: In a small pan melt 1/2 tablespoon of butter and 1 tablespoon of brown sugar over medium heat. Add 1/2 thinly sliced pear and saute just until soft, 2 minutes. Let cool then spoon over 5-6 ounces of yogurt and top with 2 tablespoons of toasted, chopped pecans. Pumpkin pie: Stir 1/2 cup of canned pure pumpkin into 5-6 ounces of yogurt then sprinkle with 2 tablespoons of toasted, salted pepitas (pumpkin seeds). Superfood sprinkle: Add 1 tablespoon each of dried blueberries, chia seeds and toasted white sesame seeds to 5-6 ounces of yogurt and stir to combine. Almond butter and honey: Stir 2 tablespoons of salted almond butter into 5-6 ounces of yogurt. Drizzle with honey to taste and stir to combine. Roasted grapes and walnuts: In a small baking dish, drizzle 1/2 cup of red grapes with olive oil, salt and pepper to taste then roast in a 350 degree F. oven until slightly shriveled, 15 minutes. Let cool, then spoon over 5-6 ounces of yogurt and sprinkle with 2 tablespoons of toasted, chopped walnuts.